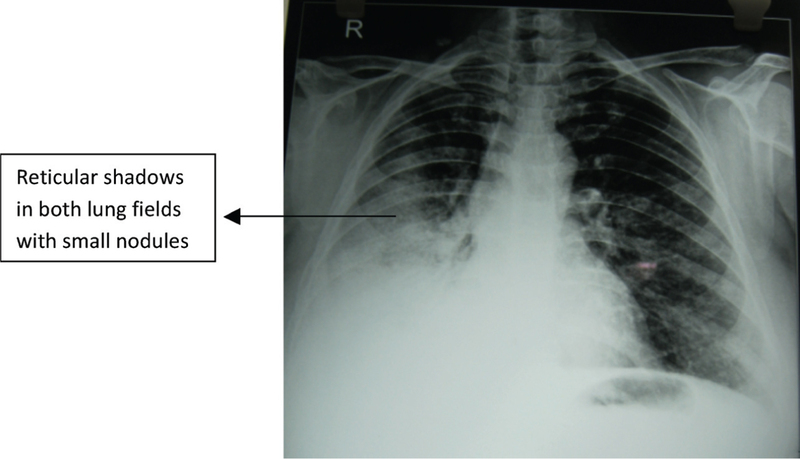 A 40-year-old female with cough, bronchorrhea of 500 ml/day, and breathlessness since 5 months was found to have bilateral ground glass opacities (GGOs) in the lung on contrast-enhanced computed tomography of thorax (CECT thorax). Bronchoscopy was normal. Pulmonary function tests were deranged. She was taken for an open-lung biopsy under local anesthesia. Biopsy from suspicious areas of right upper lobe and lower lobe via a minithoracotomy was s/o bronchoalveolar carcinoma. Patient received pemetrexed + gefitinib therapy on immunohistochemistry and survived for 18 months postcompletion of chemotherapy. Bronchorrhea was reduced after initiation of chemotherapy. Bronchoalveolar carcinoma is a peculiar form of lung carcinoma with variable clinical, radiographic, and histological presentation and occurs most frequently among nonsmokers, women and Asians. It accounts for 1% to 9% of all lung cancers. It is characterized pathologically by a pulmonary neoplasm showing lepidic growth. More than half of all patients with bronchoalveolar carcinoma are asymptomatic. The most frequent symptoms and signs are cough, sputum, shortness of breath, weight loss, hemoptysis, and fever. Bronchorrhea is unusual and a late manifestation and hampers their quality of life. It has a much lower prevalence of 5% as per recent studies. We here present an uncommon presentation of bronchoalveolar carcinoma in the form of bronchorrhea. A 40-year-old female presented to the hospital with complains of cough since 8 months which was associated with some watery expectoration. Bronchorrhea was initially infrequent and small in quantity but gradually progressed in last 4 to 5 months to about 400 to 500 ml/day, exhausting enough to produce respiratory distress each time cough appeared. It was partially relieved with bronchodilators only to recur again. There was pleuritic chest pain along with it. There was no associated hemoptysis or weight loss. She had no past history of tuberculosis or other comorbidities. A chest X-ray PA view revealed bilateral diffuse reticular shadows with multiple tiny nodules all over [Figure 1]. A contrast-enhanced computed tomography of thorax (CECT thorax) revealed bilateral scattered ground glass opacities all over the lung window and multiple nodules with no mediastinal lymphadenopathy, a finding more suspicious of interstitial lung disease. There was also a small area of consolidation in upper lobe (peripherally located) suggested by air bronchogram [Figure 2]. A fiberoptic bronchoscopy was performed which showed inflammed main bronchus as well as the right main bronchus. Bronchoalveolar lavage (BAL) fluid showed no evidence of any organism or AFB on stain/culture, including a negative cytology. The hematological and microbiological parameters were within normal range except hemoglobin which was 9 gm/dl suggestive of anemia of chronic disease. Her pulmonary function tests were deranged, hence defying the general anesthesia. Hence, she was taken for lung biopsy under sedation. A right lateral minithoracotomy was performed and chest entered through the sixth intercostal space. No adhesions were found and no attempts were made for lung mobilization. Two most suspicious sites, that is, solid consolidated area along with cystic component comprising lesion occupying the peripheral most areas of lower lobe and upper lobe were biopsied and chest closed in layers, over a 28-Fr intercostal drain. Hemostasis and absence of bronchial leak were ensured prior. Postoperative period was uneventful. On histopathology, the upper lobe specimen showed presence of alveolar structure lined by stratified cuboidal cells having hobnail appearance with atypical nuclei. Focal invasive component was noted with stromal invasion. Features were suggestive of well-differentiated adenocarcinoma lepidic growth (bronchoalveolar carcinoma) [Figure 3]. The lower lobe specimen showed features of fibrosis. Bronchoalveolar carcinoma is a subtype of adenocarcinoma of lung that is distinguished by its peripheral location, well-differentiated cytology, growth along intact alveolar septa “the so called lepidic growth pattern,” and tendency for both aerogeous and lymphatic spread. In the World Health Organization (WHO), a classification of lung tumors, bronchoalveolar carcinoma is considered as a subtype of adenocarcinoma. The WHO defines bronchoalveolar carcinoma as a subtype of adenocarcinoma with growth along the alveolar septa and without evidence of stromal, vascular, or pleural invasion. Bronchoalveolar carcinoma represents 1.5% to 6.5% of all primary pulmonary neoplasms. Most patients are aged 40 to 70 years. As with other adenocarcinoma, the prevalence of bronchoalveolar carcinoma is relatively high in women (30%–50% of bronchoalveolar carcinomas occur in women versus 20%–30% of squamous cell carcinomas). It is commonly seen in Asians. Bronchoalveolar carcinoma (BAC) is divided into mucinous, nonmucinous, and mixed subtypes, based on immunohistochemical and molecular characteristics. Mucinous BAC arises from the mucinous metaplasia of bronchiolar cells and is associated with significant mucosecretion. This subtype is commonly associated with multifocal disease, bronchorrhea, and a worse prognosis. More than half of all patients with BAC are asymptomatic and remain without symptoms even as the disease disseminates., The most frequent symptoms and signs are cough (35% of cases), sputum (24%), shortness of breath (15%), weight loss (13%), hemoptysis (11%), and fever (8%). Bronchorrhea (white mucoid or watery expectoration), once considered the clinical hallmark of this disease, is unusual, and a late manifestation is seen only with diffuse bronchoalveolar carcinoma. Although a prevalence of 27% was reported in 1953, it was reported to have a much lower prevalence (5%) in a more recent study. Bronchorrhea is defined as the production of >100 ml/day of watery sputum. It is debilitating symptom that can lead to functional decline and hypoxic respiratory failure apart from electrolyte imbalance because of large amount of fluid loss in a debilitated patient., Mechanisms of excessive pulmonary secretion production include (1) hypersecretion by mucus-producing cells, (2) increased transepithelial chloride secretion, and (3) excessive transudation of plasma products into the airways. Hypersecretion by mucus-producing cells can occur in response to inflammatory stimuli. This is the rationale for the use of macrolide antibiotics, which act as immunomodulators and reduce mucin gene expression by decreasing the phosphorylation of extracellular signal-regulated kinase 1/2 and IκB, or glucocorticoids. Excessive pulmonary secretion production also occurs as the result of increased transepithelial chloride transport, which is promoted by certain prostaglandins. Indomethacin inhibits cyclooxygenase, thereby decreasing prostaglandin production. A proposed unique mechanism for the treatment of bronchorrhea in patients with BAC is the overexpression or overactivity of epidermal growth factor receptors (EGFRs), which regulate mucin production in the lungs via the production of goblet cells and the synthesis of mucin and surfactant phospholipids. This may explain, in part, the observed success in treating BAC-associated bronchorrhea using EGFR tyrosine kinase inhibitors, such as gefitinib. However, Nooran et al. study supports the hypothesis that the mechanism of reduction of bronchorrhea is independent of the antiproliferative effect of the drug and hence may be of benefit in EGFR-negative individuals.The spectrum of radiologic findings is broad, ranging from solitary to diffuse disease. Air bronchogram is a common feature within the affected area. The basic radiologic manifestation is acinar shadows that are discrete or coalesce into an area of consolidation as evident by a report published by Clark et al. Bronchoalveolar carcinoma is now referred to as invasive adenocarcinoma. They are positive for certain biomarkers (Thyroid transcription factor1 (TTF1-100%), EGFR, and KRAS in some) and amenable to molecular targeted therapy such as oral tyrosine kinase inhibitors. They have favorable prognosis as compared to other variants—mucinous, solid, papillary, acinar. However, those patients with an infiltrative picture and symptoms have a worse prognosis. This has been a significantly studied by Okubo et al. on 119 patients of bronchoalveolar carcinoma in 1977 to 1995, where seven patients underwent open-lung biopsies for diffuse and infiltrative disease and did not survive for more than 2.5 years. Immunohistochemistry in our patient showed TTF1 positive, and we have subjected the patient to pemetrexed and gefitinib. We have noticed reduction in the symptoms (bronchorrhea) since the initiation of therapy. A 6 monthly follow-up was performed. This patient however had a survival of 18 months after chemotherapy. There are no potential conflicts of interests in the form of research grants from funding agencies, honoraria for speaking at any symposia, any kind of financial support, or employment or sponsorship, any multiple affiliations. A copy of approval from the ethical committee can be made available for review by the Editor-in-Chief of this journal. Shoib S, Malik J, Arif T, Bashir H. A case report on bronchoalveolar carcinoma presenting as non-resolving consolidation. Med J Islam Repub Iran 2012;26:140-2. Lee KS, Kim Y, Han J, Ko E, Lee KS, Primack SL. Broncho-alveolarcarcinoma: Clinical, histopathologic and radiologic findings. Sci Exhibit 1997;17:1345-57. 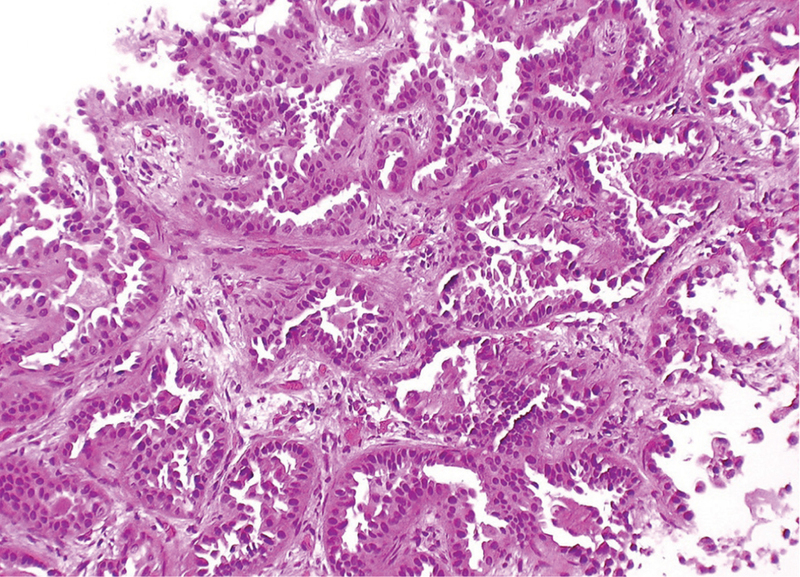 Emami M, Kalantari E. Case report of the bronchioloalveolar carcinoma. Adv Biomed Res 2015;4:30. Popat N, Raghavan N, Mclvor RA. Severe bronchorrhea in a patient with bronchioloalveolar carcinoma. Chest 2012;141:513-4. Clark LR, Stull MA, Twigg HL. Chest case of the day—Bronchoalveolar carcinoma of the lung. AJR 1990;154:1318-9. Travis WD, Brambilla E, Noguchi M, Nicholson AG, Geisinger KR, Yatabe Y et al. International Association for the Study of Lung Cancer/American Thoracic Society/European Respiratory Society International Multidisciplinary Classification of Lung Adenocarcinoma. J Thorac Oncol 2011;6:244-85. Okubo K, Mark EJ, Flieder D, Wain JC, Wright CD, Moncure AC et al. Bronchoalveolar carcinoma: Clinical, radiologic and pathologic factors and survival. J Thorac Cardiovasc Surg 1999;118:702-9.